Efflorescence deposits to external terracotta tiling. 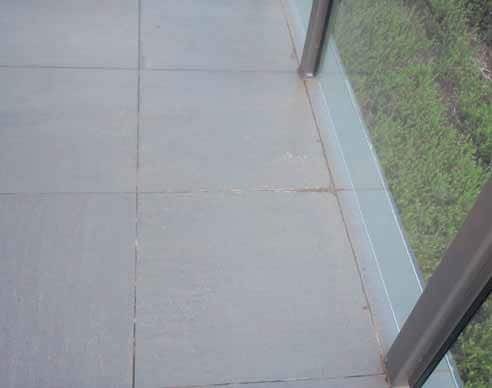 Efflorescence defects, although not classified as a functional failure, can detract from the overall finish and result in annoying ongoing cleaning and maintenance or extensive rectification costs. Andrew Golle explains. Efflorescence defects, if not addressed, lead to costly disputes and rectification. While efflorescence occurs in both internal and external tiling, we will be discussing the implications on external tiling systems. water will result in high calcium and salt deposits. Tiling defects fall into two main categories: functional failures, and cosmetic defects. Functional failures indicate degradation in the tiling system where the service life of the tiling is compromised. Functional failures are those where tiles are cracked, broken, membranes fail or where tiles lose their bond to the substrate. This is characterised by drummy or hollow sounding tiles. Cosmetic defects can sometimes create the most angst where owner’s expectations are high. But do they affect the service life and performance of the tiling system? Some do, while others don’t. performing as intended. 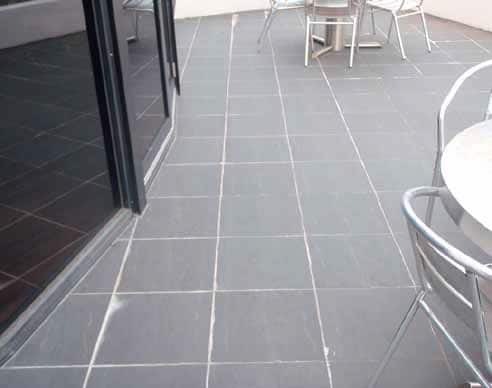 This can adversely affect the tiling system which may result in eventual functional failures. or damming at the deck edge outfall. Crystallisation deposits in grout joints terracotta filing. Tide-mark efflorescence occurs as heated water expands and bleeds to the surface, leaving puddles. Bleed water then evaporates, leaving a tide shadow or tide-mark. This typically occurs where drummy (debonded) tiles are present around the puddles. However, free standing water may also harbour in cavities within the adhesive lines of bonded tiles. Concentrated and retained sub-surface water adds excessive stress to the waterproofing and tiling system, as retained water is heated. This is the nasty type, and should be investigated as continuous cycles can weaken the tiling or waterproofing systems – resulting in functional failure. factors may override the benefits provided by functioning individual elements. Falls should be at membrane level, to avoid low points where ponding water can sit below surface materials. Bonded screed provides functional falls. Sub-surface drainage allows for relief of the sub-surface water table. 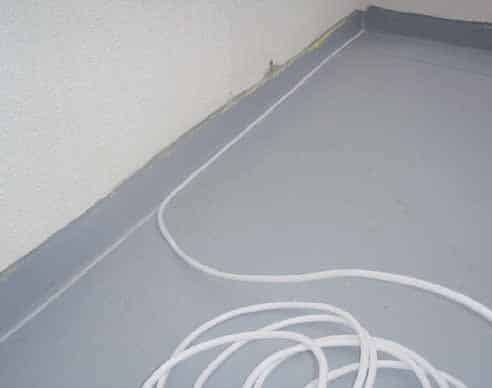 Membrane application below the screed with ineffective falls promotes ponding and therefore concentrated areas of retained moisture. Unbonded screeds may be used as a ballast or porous drainage cell, where solvent based membranes or sheet membranes are used. Screed drainage should be provided at the lowest substrate level. This can take the form of substrate spitters, slotted waste pipes and edge drainage angle. 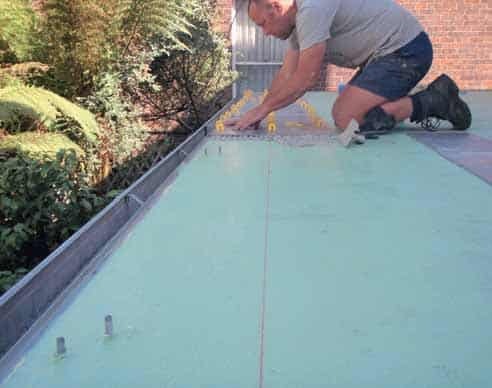 Membrane application to top of screed, backing rod at perimeter forms drainage gutter. 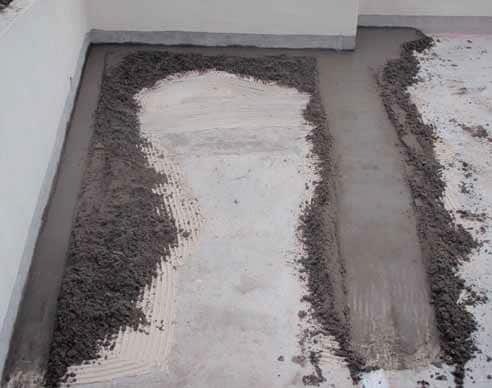 Top of screed application of membranes provides positive falls at membrane level, thereby reducing excess water holding beneath surface materials. This practice also reduces the amount of cementitious material that is exposed to sub-surface water. Should the membrane be installed below the screed, a hydrophobic additive, such as Efflok, can be incorporated in the screed mix. 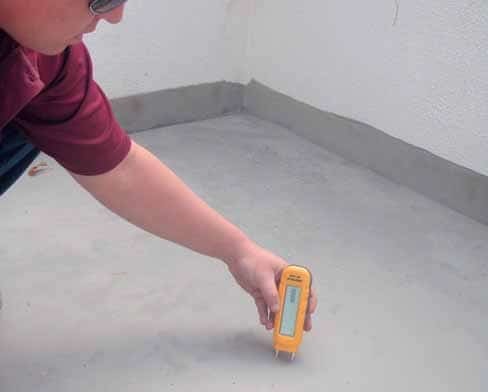 This practice is not as effective as top of bed application, but it reduces the amount of moisture holding within the mortar screed. Hydrophobic tile adhesives and polymer grout additives may also be used. Application of hydrostatic membrane over screed restricts rising damp and salts. 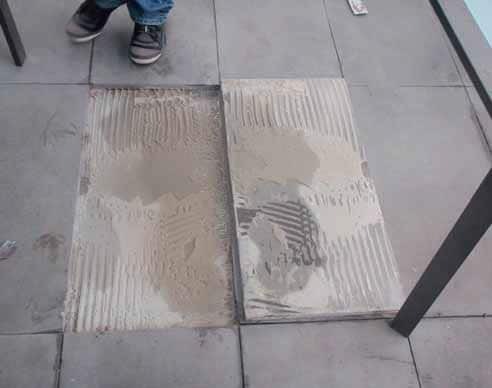 Restricting sub-tile drainage by installing a barrier edge angle at the outfall will result in water damming up beneath floor tiles and efflorescence forming as the trapped moisture has nowhere else to travel. This can also result in debonding tiles through the “Steaming Effect”, where trapped sub-tile moisture expands when heated, applying stress to adhesive systems. Salts can also crystallise within the adhesive line, causing break down of the adhesive. Edge angles that provide a membrane connection and facilitate sub-tile drainage will assist with sub-surface drainage at the outfall. Drainage water is redirected away from the building as it tracks to a drip mould. These angles are available for direct fix and screed applications. Solid edge angle restricts sub-tile drainage. Drainage angle with weep holes provides sub-tile drainage. AS 3958.1-2007 Guide to the Installation of Ceramic Tiles requires an adhesive contact coverage of 90% in external floor areas. Anything less encourages excess water to hold beneath tiles. Adhesive manufacturers require contact into 3-4mm of fi nished thin bed adhesive, in order to maintain tolerances to movement and provide a positive bond. This is achieved by using the required notched trowel, for the tile size: 10mm trowel for 200 x 200mm tiles, 12mm trowel for 300 x 300mm tiles, 12 to 15mm trowel and back buttering for larger tiles. Adhesive is trowelled in one direction and then the tile moved back and forth, one notch rib 90 degrees to the trowel lines. The Taver method embeds the tile into adhesive and expels air in the trowel lines. Swirl trowel or multi-directional trowelling will not achieve the same results as trapped air cannot be expelled and notch heights are uneven. Poor adhesive contact coverage results in free standing water holding in cavities and bond failure through the steaming effect. Less than the required 3-4mm of final thin bed adhesive will significantly reduce the sheer tolerance. ‘Drummy’ or hollow sounding tiles indicate a bond failure. According to AS 3958.1, this would be considered a functional defect where 20% or more of any individual tile is ‘drummy’ or not bonded. Bond failure defects are detected through resonance testing, where a metal tipped testing rod – rattle stick – identifies any ‘drummy’ tiles. The rattle stick will indicate, through pitch, whether the bond has failed at either the tile/adhesive interface, adhesive/substrate interface, cohesively through the adhesive line, or within underlying screeds. Each loose tile is floating, and does not restrain surrounding tiles from debonding. This becomes a chain reaction of bond failure, where one row of debonded tiles leads to the next row becoming loose as pressure is released in adjoining tiles. 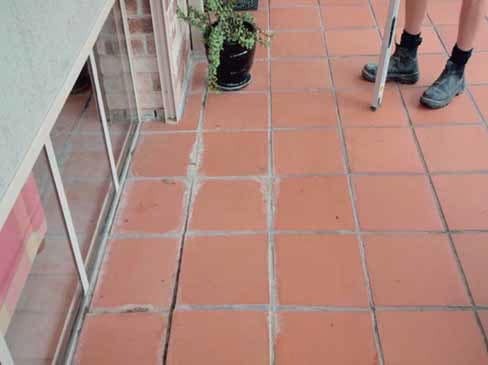 Excessive deterioration can require full tile area replacement, especially where replacement tiles are no longer available. If identified early, this type of function failure can be rectified utilising the Tile Reglue Injection Method, which will rebond the tiles in situ, without disturbing surrounding tiles. Only an approved system should be used, by licenced applicators with appropriate warranties. Tile Reglue Injection Method minimises cost and disruption times, and can usually be carried out while maintaining occupancy during repairs. 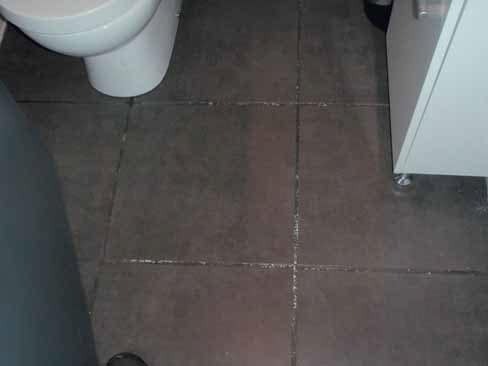 Efflorescence defects can be annoying where constant and ongoing maintenance and cleaning processes are required throughout the life of the tiling. Efflorescence signs should be investigated for indications of stresses on tiling and waterproofing systems. Localised repairs may be possible to relieve stresses; however, avoidance through observing the above design principles is better than cure. Andrew is a registered builder in Queensland, N.S.W and Tasmania, a Cert III Wall and Floor Tiler and Forensic Tiling Defect Investigator. His company, Armont Rectification Builders, specialise in solving waterproofing and tiling defects throughout the country, and are the owners of the Tile Reglue Injection Method. T.R.I.M is a specialised service to positively refix loose floor and wall tiles without removal.